“Web design” or in other words: The art of combining content and technical functionality in an aesthetic way. Companies communicate with clients in different ways and on different channels. However, in principle, it is always the same thing – a sender wants to send a message to a recipient, on a particular channel. In this case, the communication channel is your website. As with print media, it is important to make the message visually accessible. On the other hand, the visitor of your website should also find in a clear and structured, easily understandable way through your website, your offers, the product catalog and information. We always try to provide amazing results for you. That’s why huge brands trust us and so many clients recommend us. 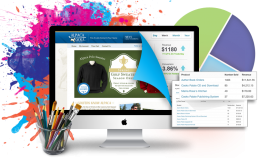 The implementation of the two mentioned aspects is the core of web design. On the one hand, the visual presentation and the technical design of the website with various available tools, on the other hand, the creation of a platform of communication in both directions – the company with the client, but nowadays also the client with the company. So, it’s about building a value-creating interaction between your company and your customers. Therefore, the term "web design" is a bit misleading because it sounds more like packaging than content. But today web design is interdisciplinary and much more complex than you might think. It all started in 1989, when Tim Berners-Lee wanted to create a global hypertext project as part of the work on CERN, which later became famous as the World Wide Web. The World Wide Web was officially born between 1991 and 1993. However, in the beginning only pure text pages could be displayed using a simple line web browser. In 1993, Marc Andreesen and Eric Bina created the web browser Mosaic. At that time there were browsers, the majority of which was based on Unix. These Unix browsers made reading a text rather difficult and there were no uniform graphic design elements such as pictures or sounds. See the Pen glitch hello world by Sean Codes (@sean_codes) on CodePen. The creation of the World Wide Web Consortium (W3C) in 1994 finally enabled the full potential of the World Wide Web to be exploited. It was also important to establish general protocols that ensured the continuity of the W3C and ensured its interoperability. However, this development has prevented the development of new browsers and programming languages that could have changed the World Wide Web as a whole. In the same year Andreesen then founded a communications company, which later became known as Netscape Communications and developed the browser Netscape Navigator. Netscape took no account of the typical standard processes and created its own HTML elements. For example, Netscape 1.1 included own HTML-programming, in order to be able to independently change background colors and to format texts on web pages. An essential difference to print media is that the terminals on which the web content is viewed at the end, are very different. Print media follow a defined system, e.g. the metric system in terms of size of posts, photos, etc. These must correspond to a certain format, nothing more. The web designer, on the other hand, has to design the product flexibly. Thus, rather relative measurements (%) than absolute (cm) are used, where the pixels are a mixture, since the unit of measurement depends on the pixel density of the output device and is thus variable. Another difference lies in the color quality and the limited resolution. Because the typical monitor, as the average user owns it, cannot provide the performance, as the print media. A glossy page of a high-quality magazine always looks better than the image of the monitor - the website is therefore rather inferior in this area. The combination with Java script can then bring additional benefits for the presentation of the website. Web designers should use these scripting languages or extensions as needed but should not forget those users who may not be using these extensions. And of course, search engine optimization is also an important task of web design. Here, a clean, strictly standard-oriented programming is essential. Of course, all content used must be search engine friendly. It should also be kept in mind that the web designer is not only responsible for the creation, but also usually for the subsequent care, maintenance and expansion. In short - the web designer is your friend and helper - from the beginning and continuously! Of course, everything related to Internet and websites is subject to rapid changes, advancements and the emergence of ever-changing trends. Currently most important trend is certainly the demand on open source solutions. Another trend is that the design is increasingly adapted to the content and usability - of course without sacrificing creativity. The trend is moving away from rhetorical designs to true interaction between operator and user. In this sense, digital spaces are created that enable a real exchange and enable the customer / user to participate actively and have a say. And here lies the real added value of an interactive website for you and your company! There is no doubt that visual communication plays a central role in the website. Whether company website, homepage of the sports club or trendy online shop - every operator of a website would like to trigger a reaction. And this he achieves first through visual impressions. Because before the user begins to actually read your content, he emotionally speaks to colors, logos, photos, graphics, font style and font size, etc. of your website. Especially with corporate websites, the recognition effect is very important - in other words, the corporate identity must be given enough consideration in web design. So, if you already have a coherent identity concept, then you should definitely bring this into your website. So, although there are certain basic requirements, creativity is otherwise very important. Because there are countless websites, and finally you want to stand out positively. Another very important aspect today is the user friendliness. What was possibly accepted in the early days of the World Wide Web, because everything was still very simple and limited, is no longer accepted by the users today. User friendliness is also referred to as usability and, above all, how easy it is for the user to navigate the site. In the jargon of web designers this is called "look and feel". If you feel comfortable on the website, you will spend more time on it. Above all, it is important that the navigation is logical and simple, that the ordering process is understandable and that the contact or the subscribing to the newsletter is simple and transparent. Just think about how you react to different websites. On which do you stay, look for information and then possibly buy the offered products? Which do you leave quickly and above all annoyed, because you click around are not able to find, what you are looking for, or during the check-out serious doubts about security of your credit card information arises? So, how you react, also your customers react- that's how easy it is. Another point is certainly that the users are very diverse in terms of age, background and knowledge. Today even retirees order on the internet and small children frolic while surfing the web. Websites must therefore be understandable to a fairly wide audience. A web designer must now do all the tasks described and connect the different aspects. Sometimes this is very tricky, because it is not always easy to reconcile aesthetics and usefulness. Maybe the technical implementation does not play along with it. Often, the technical requirements are not given by all users, so this creates a certain exclusion. Important target groups may then not be reached in such a case. To prevent this, one can, e.g. in addition to the possible use of many multimedia content or Flash applications, also provide text alternatives. So, if you cannot see the video, you can at least call up a text that explains the same facts. We are located near Nuremberg in the heart of Bavaria, Germany. Bavaria is well known not only for its great beer and the Oktoberfest, but also for awesome & stunning web designs! Let us be your partner, contact us for a free consultation. See the Pen character movement study by Thibaud Goiffon (@Gthibaud) on CodePen. A good example of what’s possible. Click on the widget and use your arrow keys to move around. Isn’t that awesome?